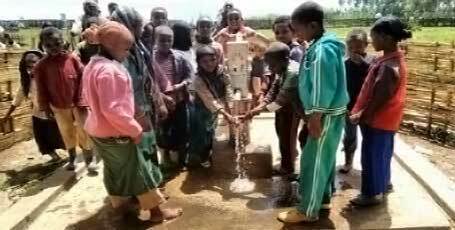 Lifewater Home / Blog / Safe Water Improves Education. Education Reduces Poverty. Safe Water Improves Education. Education Reduces Poverty. Education reduces poverty–studies have shown that education is an essential step along the path out of poverty worldwide. People experience an 8.3% increase in household earnings for every additional year of school. Education is linked to greater household income, longer and healthier life, and increased community participation and leadership. But education is out of reach for millions of kids with no access to water and sanitation. They, and their families, are stuck in a cycle of poor health, missed education, and poverty. The change can already be seen in West Arsi, Ethiopia, where Lifewater is working with schools, communities, and local governments to install sources of safe drinking water, blocks of hygienic latrines for boys and girls, and a knowledge base that encourages lifelong health. At the graduation event at the Illu Dhiha Primary School in Jafaro this year, the district education office announced the addition of three grade levels beginning September 2017. This means three more years of education for local children. Before, if a child wanted any education past primary school (about 5th grade), he or she would need to leave home and attend a boarding school far away. Very few could afford it. Now, parents’ dreams for providing an education for their children are coming true. The addition of three grade levels at Illu Dhiha Primary School is confirmation the Lifewater Healthy Schools program is making an impact. Lifewater helps schools establish a safe water source, build dignifying latrines for students and staff, create handwashing stations and preserve a clean school compound. Plus, Lifewater establishes school-based WASH Clubs that uses peer-to-peer contacts to help kids stay health and in school. Since the work always involves parent groups and local government, the improvements multiply and become self-sustaining. Safe water, sanitation and hygiene lead to improved education, and education reduces poverty, breaking the cycle that often lasts for generations. Congratulations to the graduates of Illu Dhiha! See you again in the fall.